All right, Los Angeles. It's time for another night of storytelling. I invite you to join me for the latest edition of Disoriented Comedy's Family Reunion. 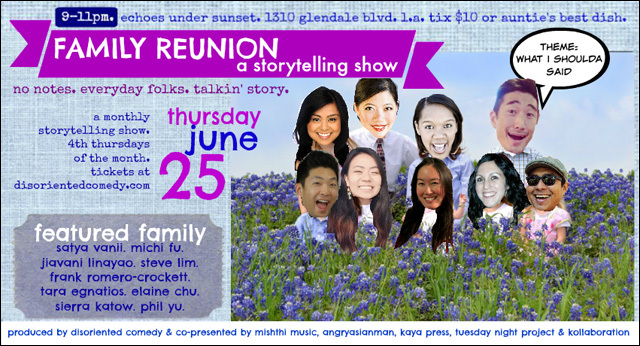 The monthly storytelling show, co-presented by Angry Asian Man, Tuesday Night Project, Mishthi Music and KAYA Press, features regular everyday folks talking story. No notes. The theme of this month's show is "What I Shoulda Said" -- stories of missed opportunities, shame and regret. The lineup of storytellers includes Elaine Chu, Tara Egnatios, Sierra Katow, Frank Romero-Crockett, Jiavani Linayao, Steve Lim, Satya Vanii and Michi Fu. And I have the honor of serving as the evening's host. Dis/orient/ed Comedy's Storytelling Show series. This is a monthly show (Every 4th Thursday) co-presented by Kollaboration, Angry Asian Man, Tuesday Night Project, Mishthi Music and KAYA Press! Stories of missed opportunities, shame and regret. Tickets $10 (cash preferred) or Auntie's Best Dish. At-the-door tickets $10 CASH OR CREDIT when we open doors at 8PM for preshow drinks! + ELAINE CHU. comedian. actor. improvisor. + TARA EGNATIOS. hot. gay. funny. + SIERRA KATOW. harvard kid. comedian. sgv-native. + FRANK ROMERO-CROCKETT. community worker. gregarious human. + JIAVANI LINAYAO. comedian. improvisor. storyteller. + STEVE LIM. kollaborationer. actor. future kpop star. + SATYA VANII. actor. comedian. writer. + MICHI FU. taiwanese. doctor. therapister. + HOST: PHIL YU. angry. asian. dude. Hope to see you at the show! It's a really fun, cool event, and I always walk away feeling like I was part of something special. For further details, check out the Facebook event. To purchase tickets, go here.